This idea has been around for a long time, but don't you think the diaper cover looks fresh and fancy in these colors? I made these for a friend who is an amazing photographer. Don't you just love this picture? This is her "quick, get a picture for Tammy" photo and it looks great. Be sure to check out her "real" work--gorgeous! To make these, start with a diaper cover. I made the diaper cover so that it would be exactly the right color. 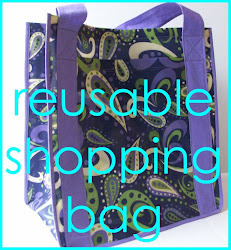 You can also just buy it in the color you need or you can dye a diaper cover. Then, decide how many ruffles you want, what colors you want and go for it. I used chiffon for the ruffles. 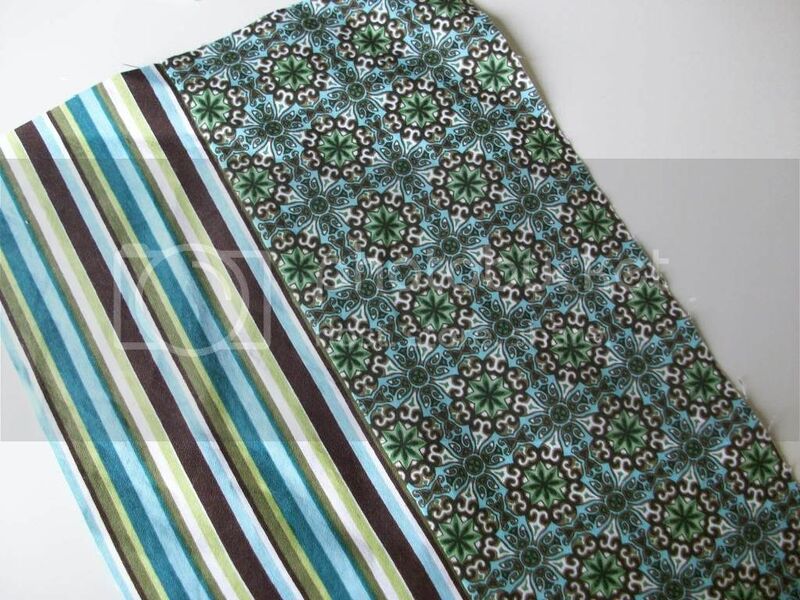 After cutting the chiffon into strips, I gathered it using a long stitch, then sewed it to the diaper cover. That's really all there is to it. I have been feeling kind of overwhelmed and blue lately. I think it is due to all of the gray skies and white snow. Spring is coming, spring is coming--I keep trying to remind myself! So, instead of focusing on those "colors" let's focus on something merry and bright! Today is the 25th of the month which means we are working on getting ready for Christmas. By now, I hope you have made a list of everyone you will need a gift for this year. And, have you written an ideas down yet? I found one idea I loved for a gift for my husband. It is little and not very memorable, so I am feeling pretty pleased that I was already organized. I knew right where to write it down and feel confident that it won't be forgotten. If you have ideas you want to share, please leave me a comment. I'd love to hear your gift ideas! I need to learn how to do a link party so we can just keep it going throughout this year. I will add that to my assignment this month! for your Christmas cards or letters. So, however you save addresses, let's get them organized once and for all this year. Sort them, change them, update them, throw away the scraps and get it organized. You will love being able to just print them out on labels or follow a nice, clean list as you address your envelopes. You won't have to hunt or dig or worry. Next meeting: March 25--don't miss it! Take THIS Little Bleach Stain! Bleach! Yechh!! Avery insisted on helping me clean (without her plastic apron!) and I insist on cleaning toilets with bleach-based products. I love that she loves to clean the toilet, but I did not love this. I have stewed about this for a while and thought of several solutions. This is the one I decided to go with because it was quick, easy (of course), and cheap. It will be perfect for spring in Michigan since spring is often pretty cool here. Instead of a shirt, it will be a dress. You can easily do this, too, with any shirt whether it has stains or not. 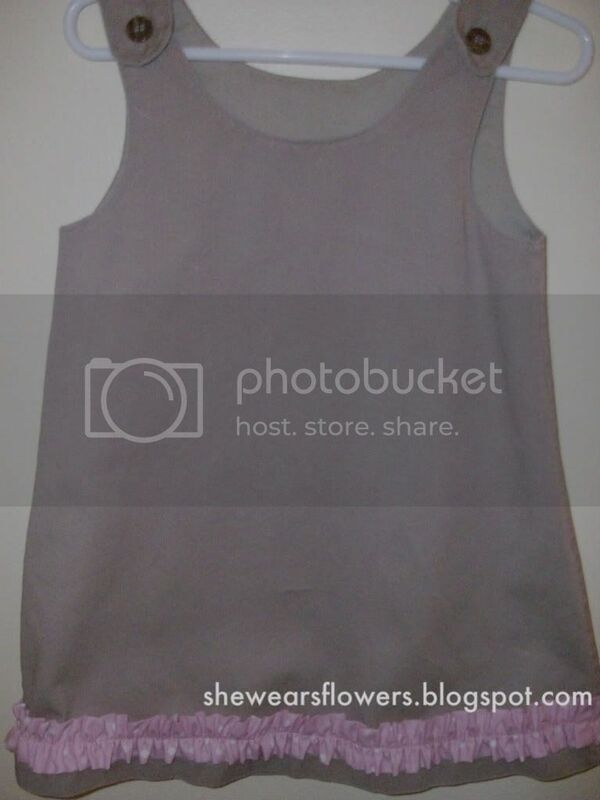 All you need to do it cut off the shirt and add your skirt part. You could lengthen the life of a shirt this way, too, and just make it a longer shirt. The directions are the same for a skirt or a tunic-style top; just change your measurements. 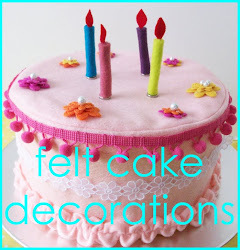 You can also had a ruffle or other decorative element. It is pretty versatile. 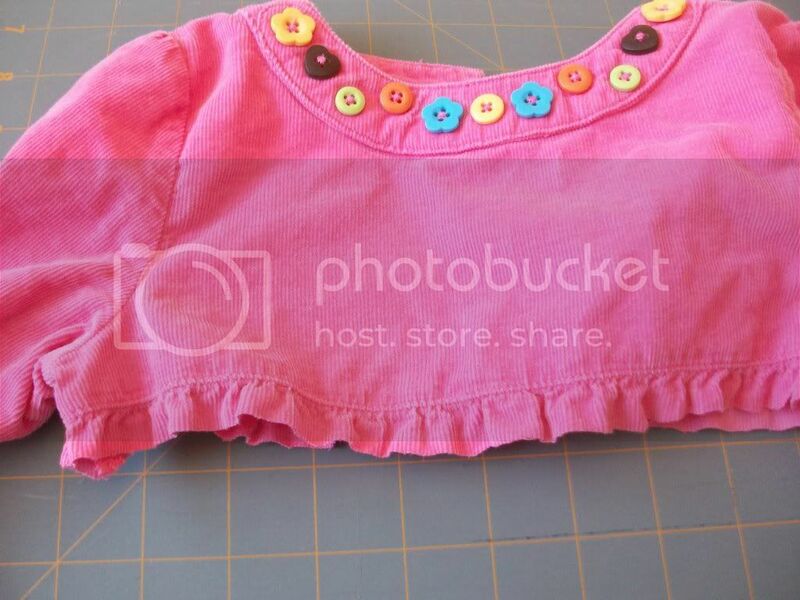 I kept it simple since my fabric is pretty busy and the shirt is already decorated with colorful buttons. 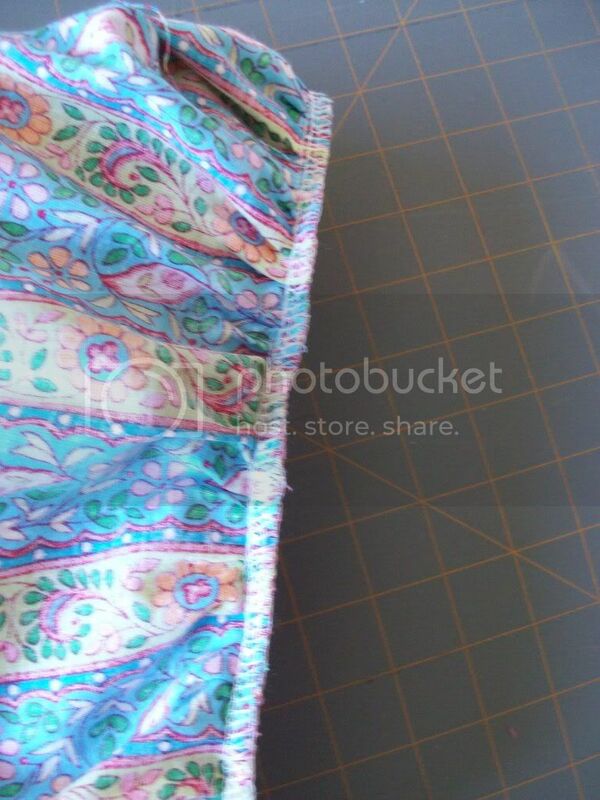 Cut a rectangle to make the "skirt" part of the dress. I actually cut mine the "wrong" direction because I wanted the stripes to be vertical not horizontal. Since I am gathering it, this shouldn't be an issue. I almost doubled the width I needed so I would have plenty of gathers. I used another dress to determine the length and came up with 18 inches which included my seam allowances. Fold your rectangle in half and make a mark at the fold using a water-soluble marker or a pin. This will mark the side since this side doesn't have a seam. You will use this later when you are attaching your skirt to the shirt. Next sew the gathering stitches at the top (width) of your skirt part. You need to sew at least two (3 works wonderfully better) rows of your gathering stitch. It is simple, but it makes a huge difference in how smoothly your gathers fall when you sew it to the shirt. Start your stitch about 1 inch in from the edge and end about 1 inch from the opposite side. 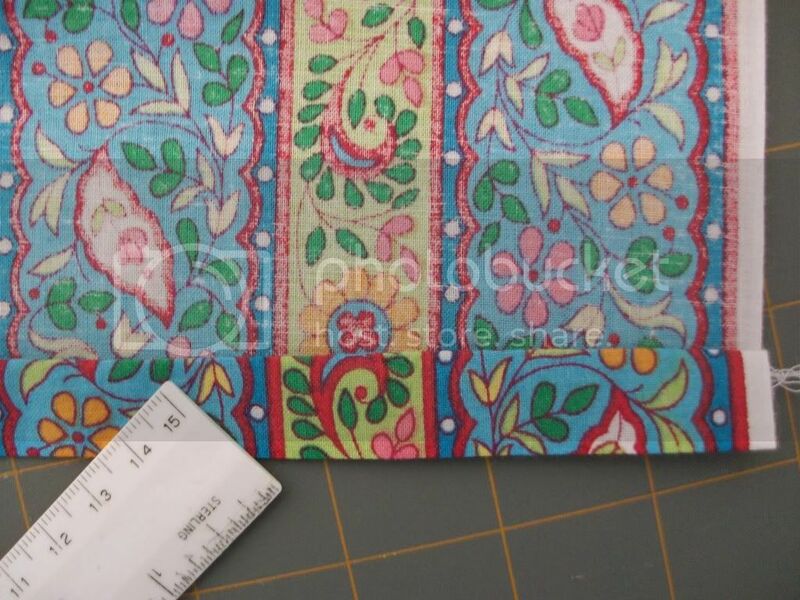 I sew at 5/8 of an inch, which is standard, and then again about 1/8 (or more--there is no exact science to this--just fit in two more rows before you sew off the edge) of an inch closer to the edge and then another one another 1/8 inch closer to the edge. It is a little tedious, but it goes fast and, trust me, it is worth it. If you set the tension to the highest number and your stitch length to the longest stitch, your machine will do most of the work for you. I like to start the hem next, but do not sew it down yet. You want your hem to be sewn last so the side seam gets tucked into it for a more professional look. You can go here (look for the turquoise highlighted part at the bottom--it was a long post!) for a detailed explanation on doing the hem first minus the sewing it down part. 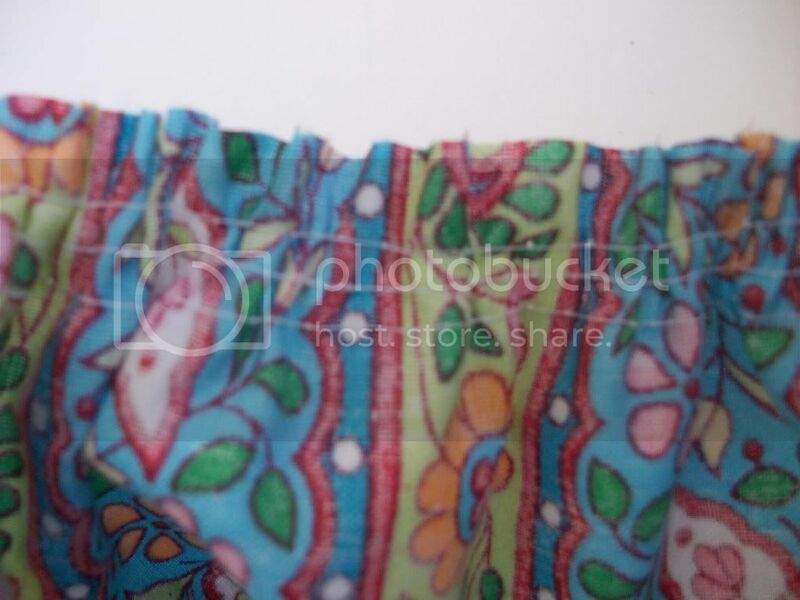 Next, open out the ironed down hem and sew/serge the side of your skirt together. Now you can go back and fold your hem up along the lines you already ironed down. Sew it in place. Iron it smooth on the front and back sides. Cut your shirt off being careful to leave a seam allowance if you need to. 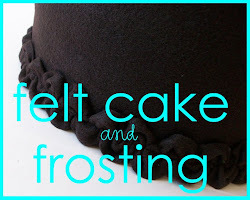 I wasn't sure how to do mine since it had a ruffle attached to it and a seam in my way. I didn't want to cut above that point because it would be too short and I worried it would get bunchy under the arms. 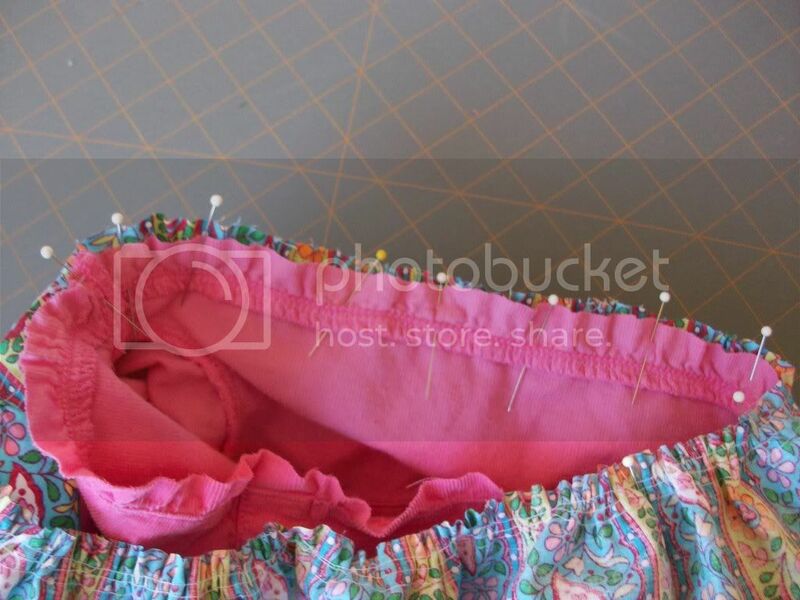 I was too lazy to take out the top stitching and the stitching to remove the ruffle. In the end, I cut off the ruffles as carefully as I could so the seam allowance was as even as I could make it without actually meausuring. I left the previous seam in but had to sew it down again later when I topstitched. And, this also meant that my new seam had to face downward instead of upward. A little weird, but it seems to have worked. None of this is an issue if you don't have a seam at this point on your shirt. This is what mine looked like. Pin the sides with the seam and marker first. They should line up with the side seams of your shirt. 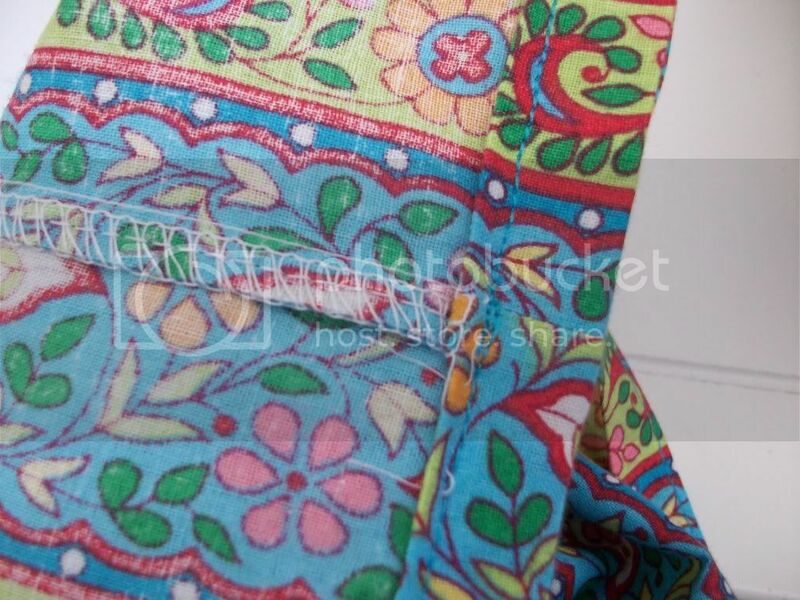 If your shirt didn't have two side seams, you should find the sides and mark them just like you did on your skirt piece. By lining these up first, you are helping to distribute the gathers evenly around your new dress or shirt. Gather up each skirt section until it matches the width of the shirt in the front and the back. 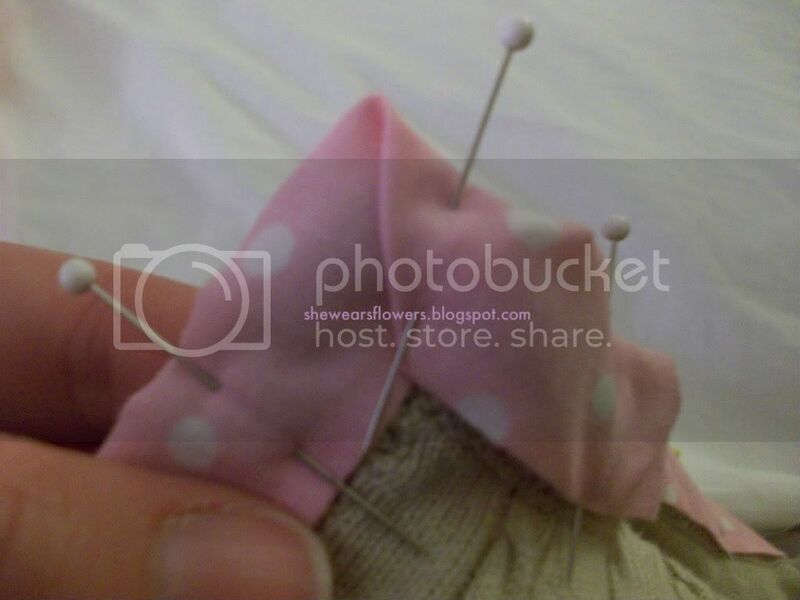 Pin in several places to hold the skirt section. I pinned a lot because I wanted to be certain I was sewing where I wanted to--it was a little crazy with that extra seam in the way. In hindsight, I should have just taken it out along with the topstitching. Sew in place using a regular stitch. I used a 5/8 inch seam. After it is sewn, turn everything right side out and check to make sure it is right--it is a lot easier to fix it now if you need to do so. If it looks good, serge the edges if you would like. Clip any wayward threads. On the outside (right side) iron the seam smooth while making sure the serged edge underneath is facing the top of the shirt. I added a quick flower embellishment because it was easy. Actually, so easy that I made two so I could use one for a hair clip. Take a strip of your leftover shirt piece (I cut mine down to about 1 1/4 inches wide after the picture was taken) and run one gathering stitch along the long edge. Mine was pretty close to the edge--maybe 1/4 inch. Make a flat circle with the gathered strip. Then, while holding the first one, make another one behind it and another one behind that. My strip ran out at that point. The circles won't lay perfectly flat, but you will beat them into submission when you sew them down. I just sewed around the center section kind of randomly so that it sewed through all of the thicknesses. 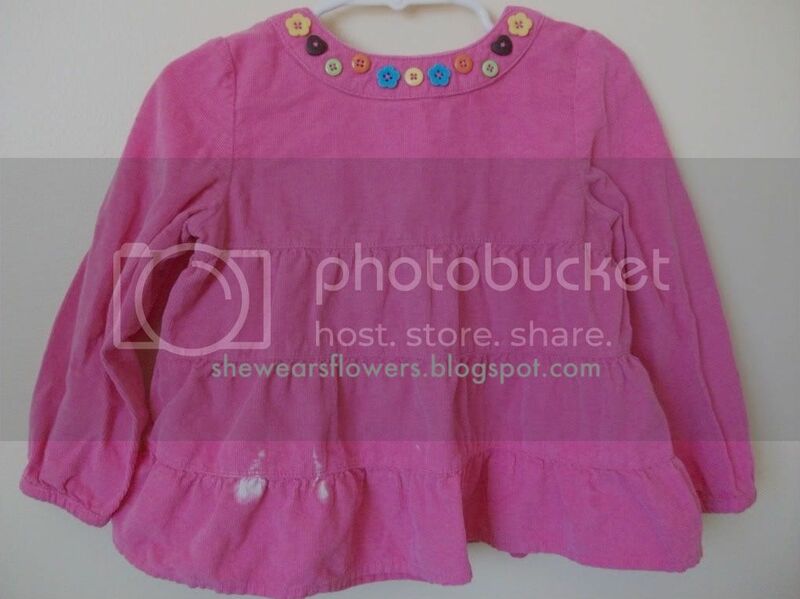 Sew on a contrasting button right in the center of your flower. 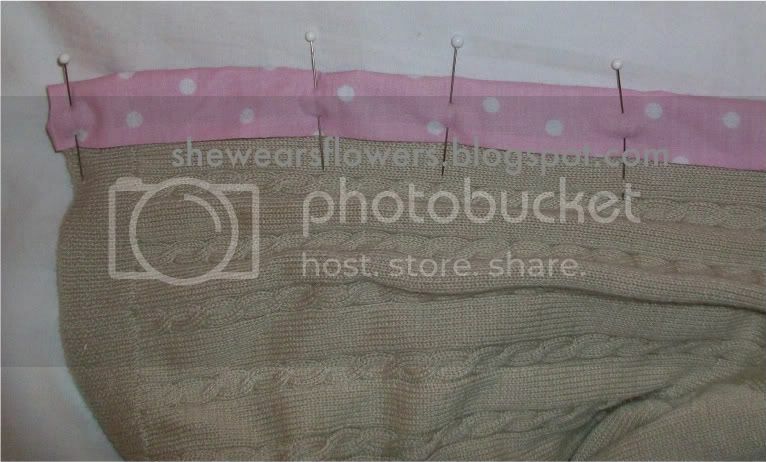 Since I didn't know exactly where I wanted to place my flower on the dress, I just put a pin through the back so I can try it in a couple of places before I attach it by hand. I also made another one into a hair clip. 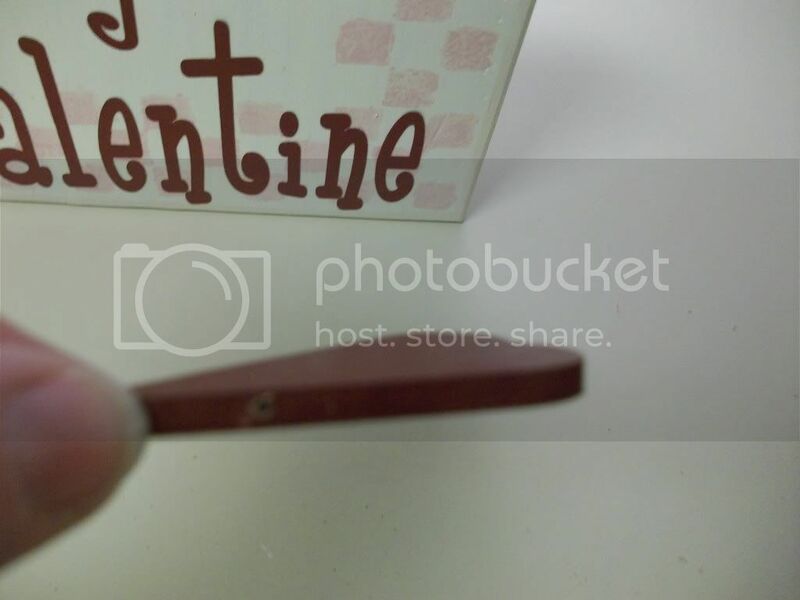 This one can be hot glued to whatever kind of clip you want to use. Make two more and you have shoe decorations. Oh, the possiblities are endless. Just don't wear them all at the same time! I was tagged by Josée at Dans ma maison, il y a....mes passions (loosely translated this means "These are the things I love to do in my home.") Her work is so beautiful! And, I have been blog hopping around her favorite places and found even more wonderful (and yummy!) stuff. I love the blogging world! I have never been tagged, so this was kind of fun. And, it was a great way to get to know some new and amazing blogs! I had to use the translator feature to be able to read some of them, but it was worth it. The translation makes things come out a little strangely, but you get the important information and it is fast. Now, I get to choose 6 people to tag. You are supposed to find the 10th picture from your picture file and send it to 6 blogging friends asking them to do the same. I chose six blogs that aren't necessarily on everyone's blog roll, but definitely ought to be. I love these blogs! After you post your tags, be sure to let the people you have tagged know you have done it so you don't freak them out too much! I am not big on remaking clothing. I have a hard time tearing into something that already looks cute just to make it into something else. 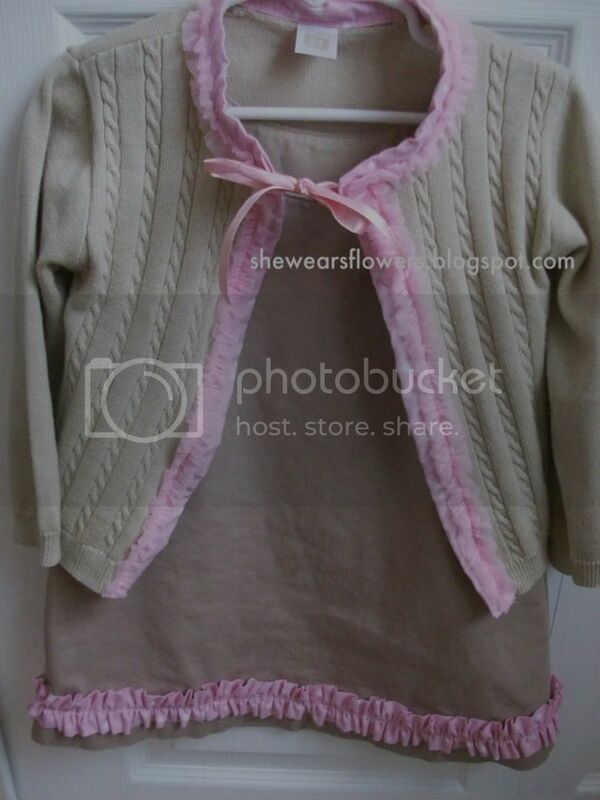 Then, I got this cute little cardigan super cheap. 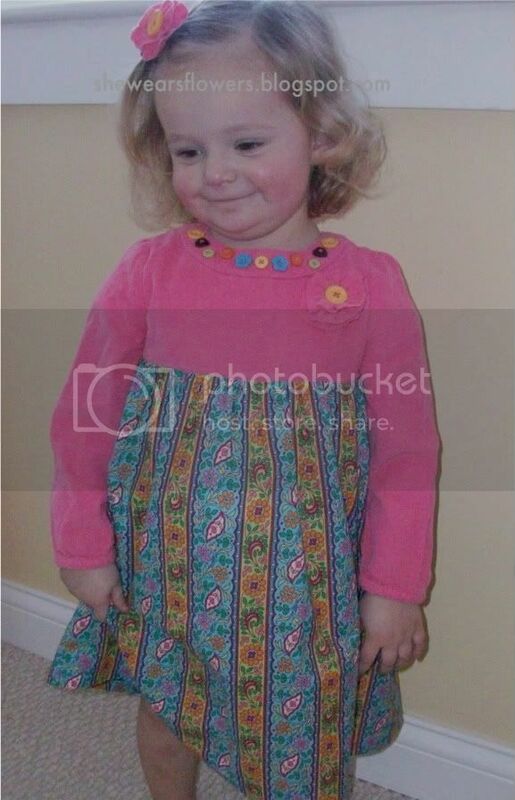 I loved it, but it made my toddler girl look more like a toddler boy. I wasn't loving that. 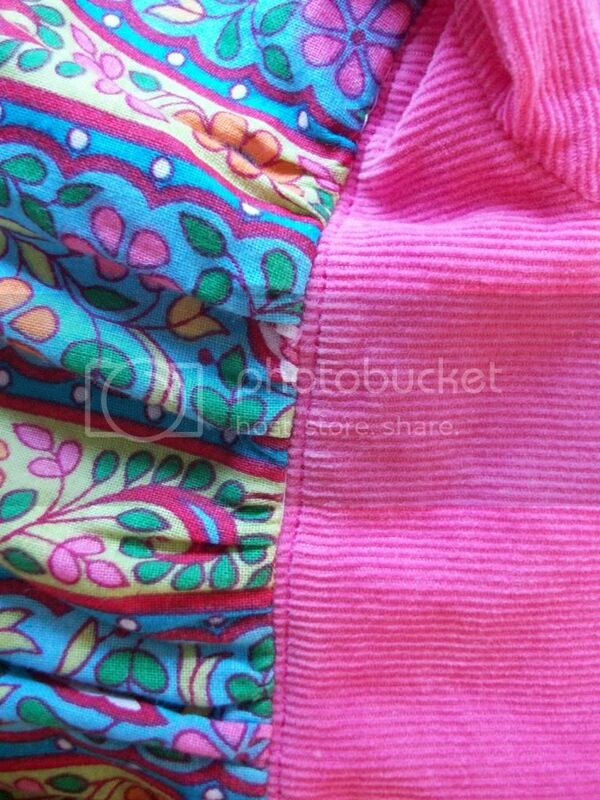 A friend suggested adding some ribbon to the placket. I thought about that for about 6 months before I came up with the following idea that would, essentially, remake the cardigan (baby steps...). I was also motivated by the jumper that I found in a box in the basement because I knew it would work perfectly with this cardigan. The jumper just needed a little pizzazz. It was cute the first time around, but it was a different daugheter with a different personality. All it needed for Lady-Loo was a little ruffle. Very easy and it added a lot! All I did is make a tube with the pink polka dot fabric. I ironed the tube flat and then gathered it to make a ruffle. I sewed the ruffle along the bottom and it's done. Looks so much more sweet and fun than it did before! The cardigan was a little more work, but not much! 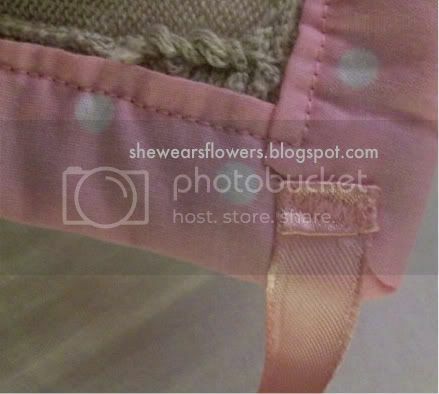 After removing the buttons, I sewed homemade bias tape (using my favorite pink polka dot fabric again) around the entire placket including around the neckline. 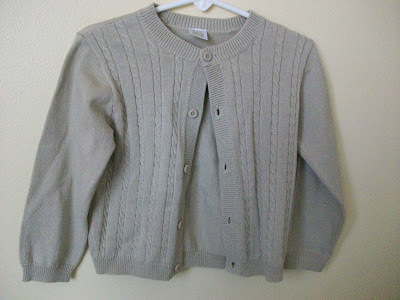 I sewed a piece of ribbon to each corner of the neck opening so the cardigan could tie together at the top. Finally, I made a tube out of nylon chiffon, gathered it into a ruffle, and attached it to the sweater on top of the bias tape. That's it. I didn't do much, but, Oh, what a difference! Now, if I could just get that squirmy little girl to let me take a picture of her in it, that would make a huge difference, too. These pictures are a little "flat" and a real person would breathe more life into it. But, I can't figure out what bribe will make her do it. Besides, she has been sick, so I didn't want to be the meanie. This is what she does most of the time when I ask to take her picture. I only have so much to work with here! Burp cloths to match the rag quilt, that is! Of course, these are easy, too, because I have come to the realization that "easy" is my main requirement for a project. 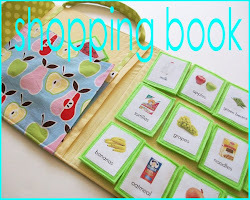 You can make burp cloths any shape or size you want because the directions are basically the same. I made these rectangular because the same wonderful friend who gifted me a beautiful rag quilt also gave me burp cloths made out of the same prints and they are rectangular and I love them so! My daughter now uses them as doll blankets and "lovey" blankets. I still use them for the gross stuff--wiping her nose and face. 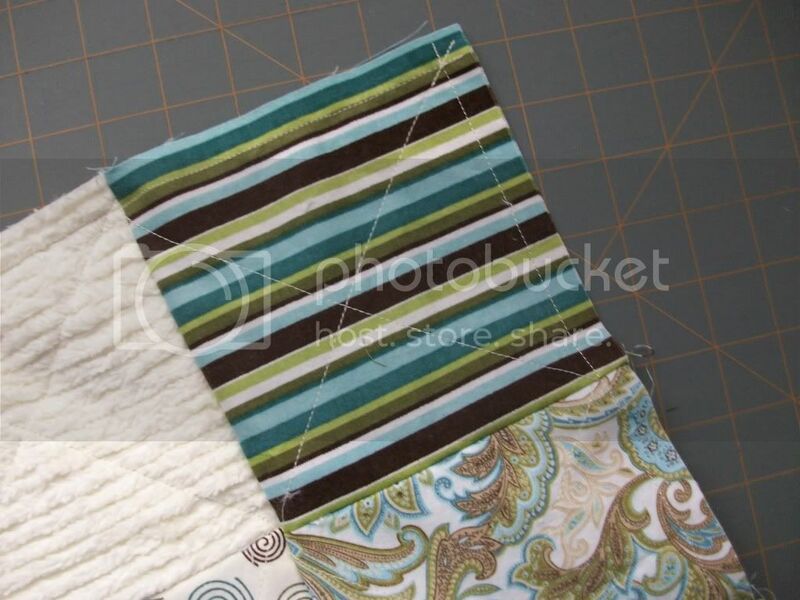 You will need some terry cloth and several cotton prints for this project. I bought my terry cloth at JoAnn's, but you could probably recycle towels for this, too. Cut into 10x14 inch rectangles. 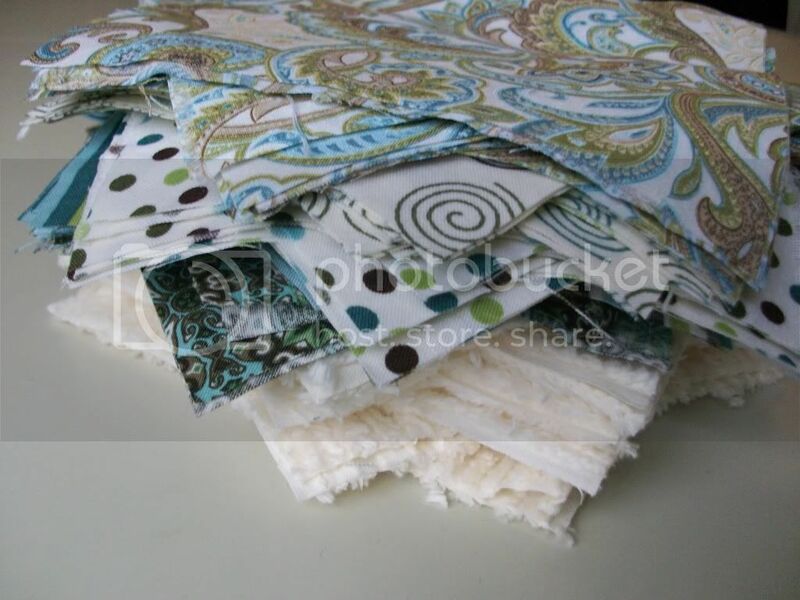 Using your pre-washed prints from the rag quilt, (or some scraps if you are making burp cloths only), cut out rectangles, squares, strips in a variety so you can piece them together to make a 10x14 rectangle. I sewed using 1/4 inch seams. 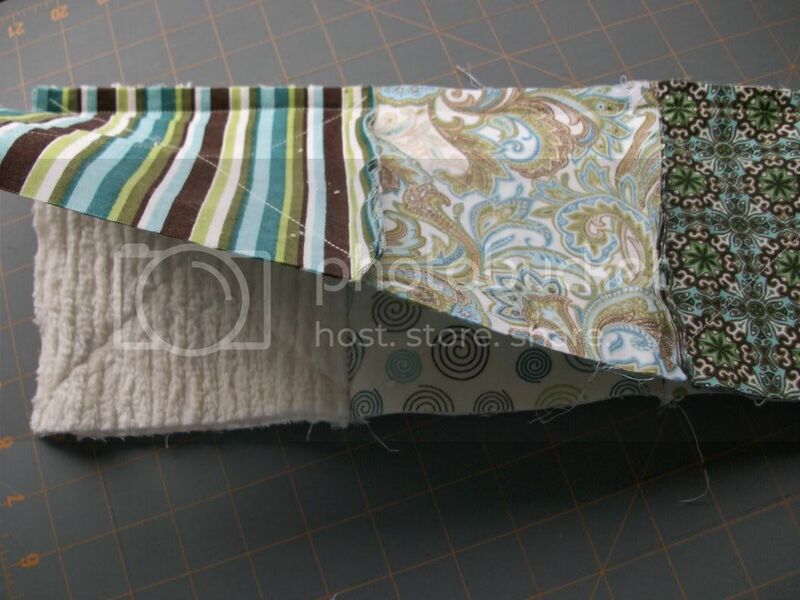 Be sure to allow for your seams if you are cutting your pieces to put together (not using scraps). Since I used "scraps" from the rag quilt, I didn't worry about this. Instead, I sewed things together the way I wanted them and then cut it down to the right size. Iron all of the seams flat and then flip it over (right side) and iron all of the seams smooth. 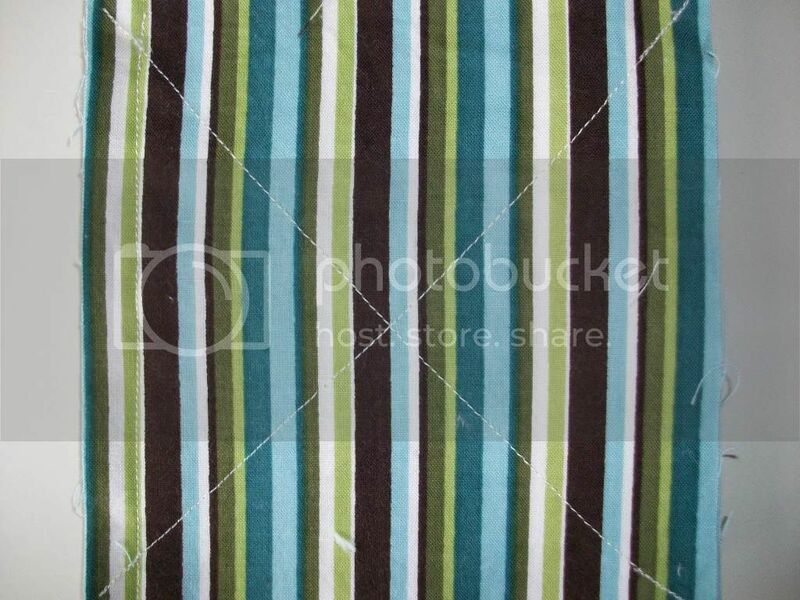 Stack your terry cloth on top of this with the right sides facing each other. The wrong sides should be outside. You will sew on the wrong sides. I also pinned in random places to hold the terry cloth still--it slides around otherwise. 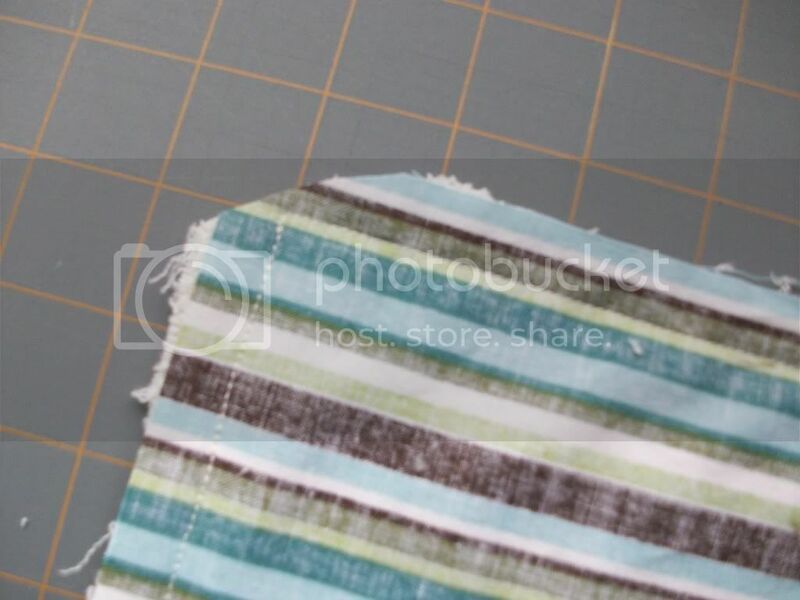 Sew around the rectangle using 1/2 inch seams. I wanted a bigger seam for this so it doesn't slip out which sometimes happens with a narrow seam on an item that gets a lot of wear and tear. Leave an opening on one edge. I like to leave an opening that is not one of the corners. 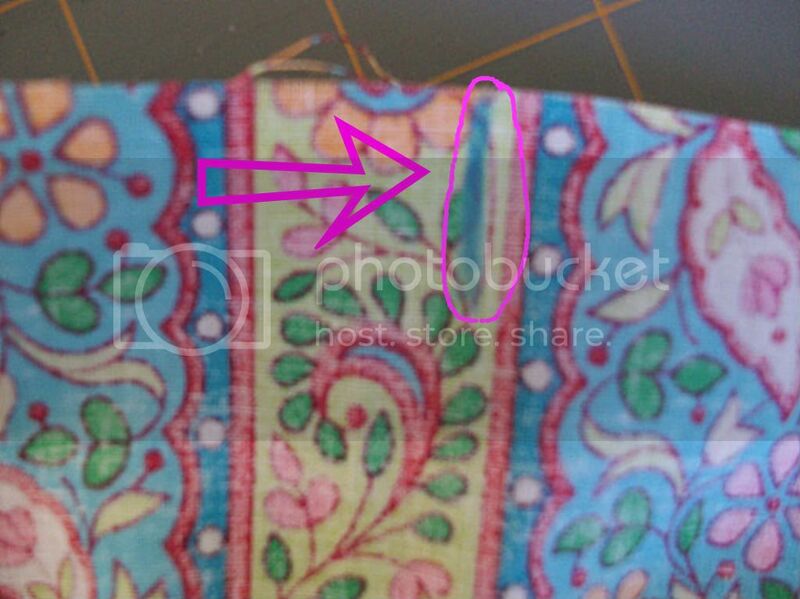 This way, my corners will be sewn the same and the opening can be reinforced easily with backstitching. I backstitched a couple of times to reinforce the starting and ending points. Clip off the corners being careful not to cut through your stitching. 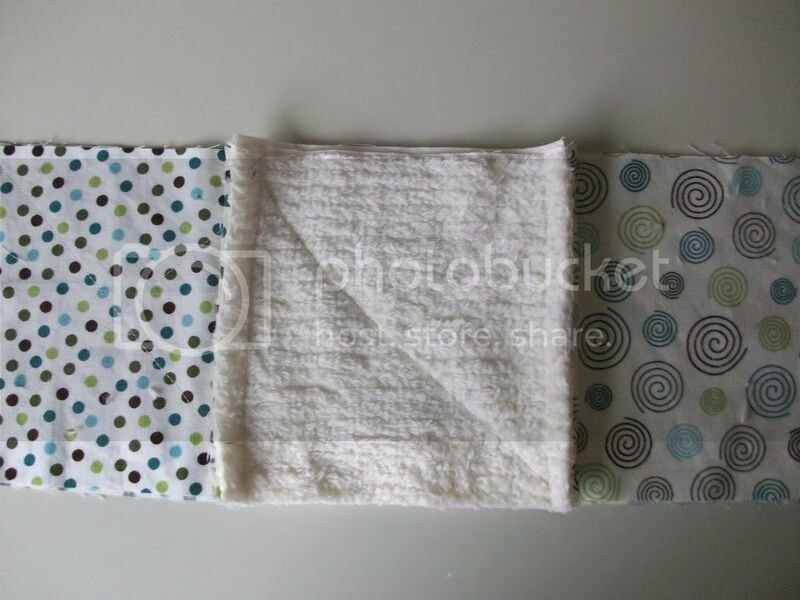 Flip your burp cloth right side out by pulling it through the opening gently. 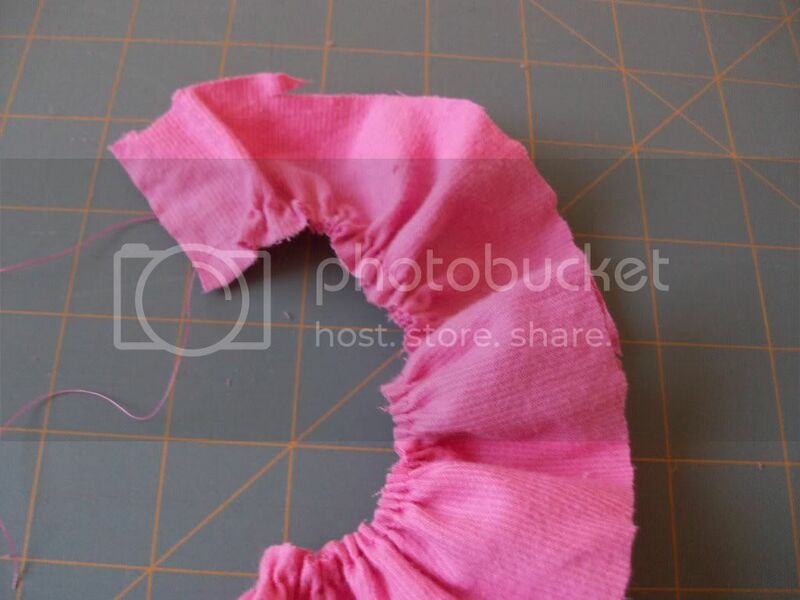 Gently push the corners from the inside out to make them into corners instead of bunched up fabric. Iron them flat and smooth. Also, iron your opening so the edges are tucked to the inside about 1/2 inch and even. Pin it in place. Sew around all sides. I like to start at the corner nearest the opening so the opening is taken care of first. You can use any stitch you would like--decorative or plain. I generally line the edge of my burp cloth up with the right edge of my presser foot so the decorative edge is near the actual edge. 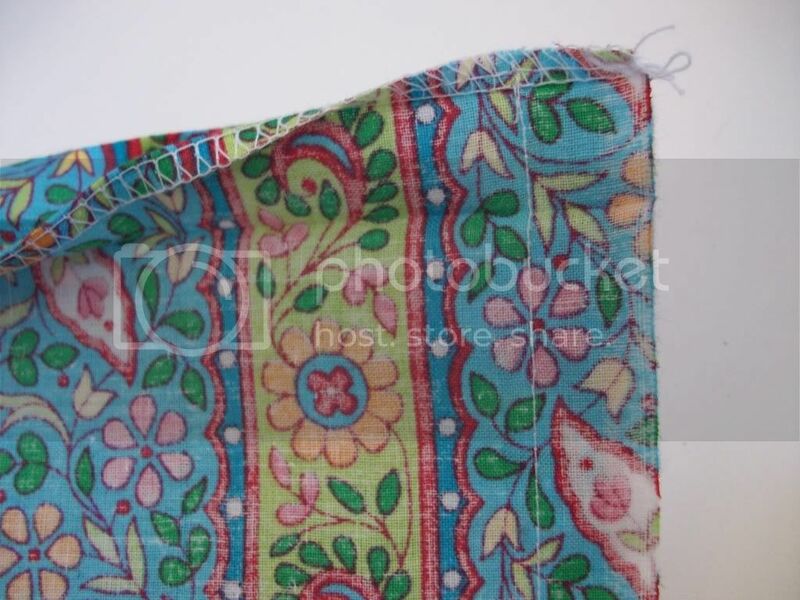 It doesn't really matter where it is as long as you are less than 1/2 inch to catch your opening in the stitching and you want to be sure to line it up with something so you can sew in a generally straight line. I also tend to round the corners instead of stopping and turning, but either way works fine. Catch that spit up in style! Or cover a dolly, or wipe a nose, or make a portable security blanket. Whatever you do with it, just enjoy it! It may be simple, but I think it still counts--it is a Rag Quilt so "quilt" is right there in the name. This is one of the most satisfying projects I have ever made. It takes time, but it isn't hard and it looks so good as you go along that you can't help but love it. Unfortunately, this is the only picture I have of the finished product. 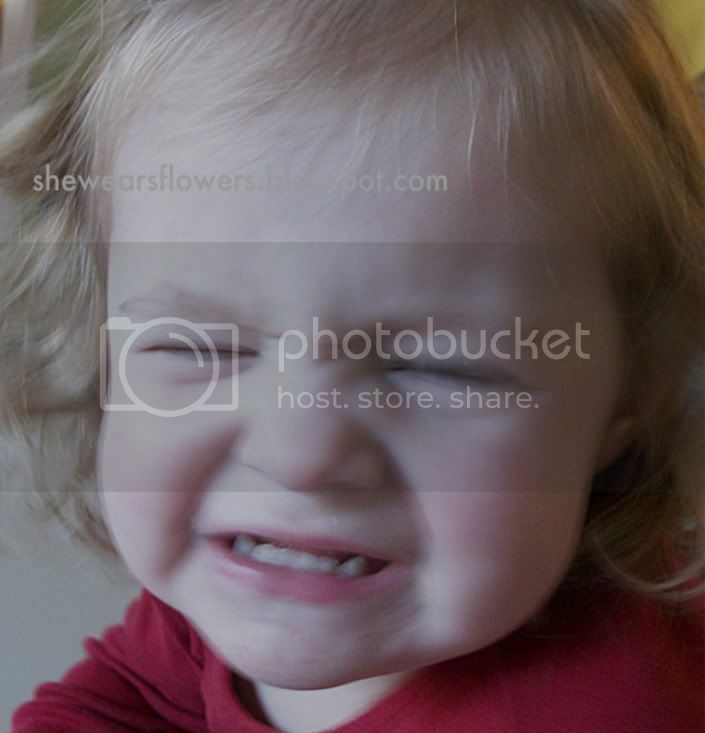 I bribed my little Lady-Loo with fruit snacks to get this picture. 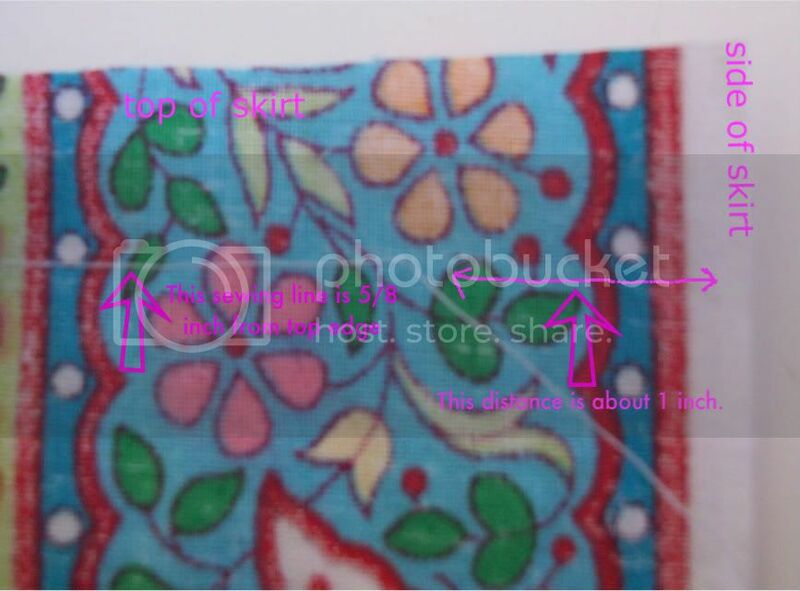 Apparently the price is higher for more than one picture. One of my all-time favorite gifts when I had Avery was a pink quilt like this that a good friend made for me. Avery still loves and uses the quilt. This one is a gift for a friend who had the cutest baby boy ever. He is her first baby and I wanted something special for her. She used to live next door to us and she and her husband have been so kind and generous with my children. I had lots of time to think about what I wanted to give her and when I thought about my favorite gift, I knew I wanted to make her this quilt. But, let me remind you: I have no idea what to do with boys! I spent SO long at the fabric store trying to find the right colors. In the end, I loved the colors and the way it turned out. 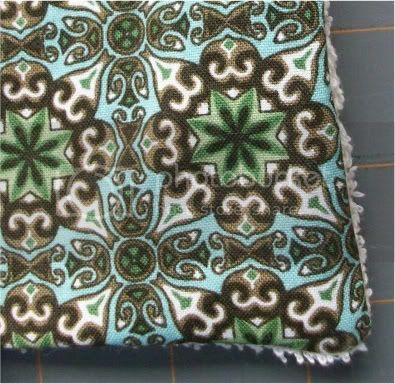 You will need 6 different fabrics for this quilt. The finished size is approximately 30x40 inches or 6 squares x 8 squares. 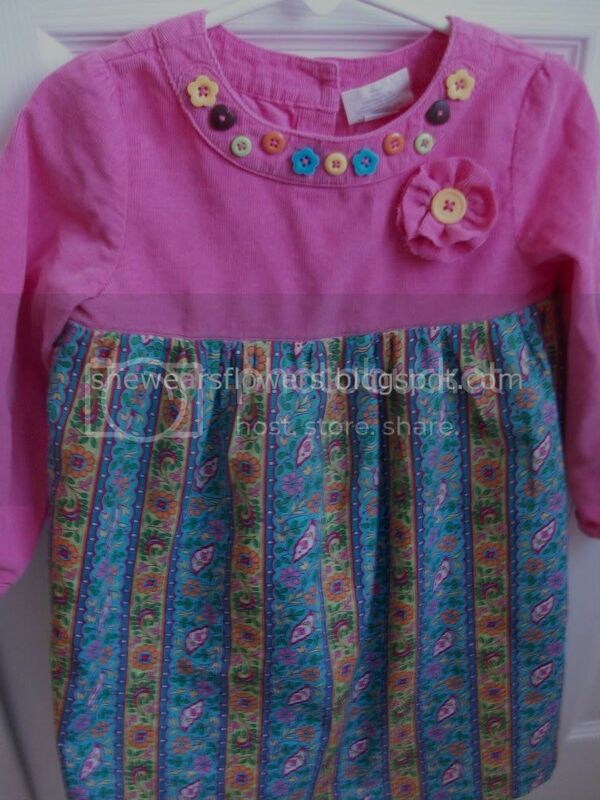 I used 5 100% cotton prints and 1 chenille (it may be 100% cotton, too--I have forgotten). I bought 1/2 to 2 yards of each one because I wanted a lot of freedom. I think 1/2 yard each would work fine. All fabric should be prewashed in warm water to prevent shrinkage later. And, for this quilt, it will soften it and get it started on the fraying process which you will want later. Iron your fabric so it lays nicely when you cut it. 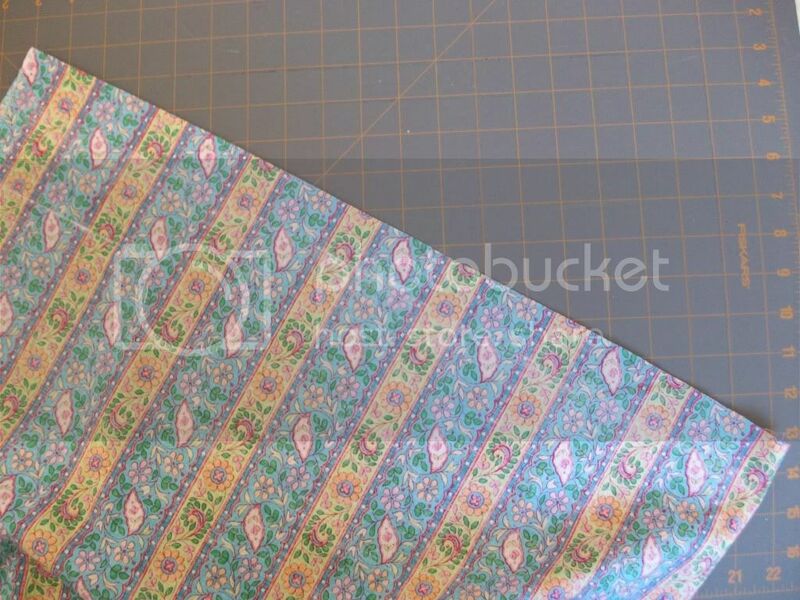 First, cut your fabric into 6 inch squares using your rotary cutter. You will need 16 squares of each fabric. I stacked mine two at a time, back to back, in alternating directions so the next step would go faster. 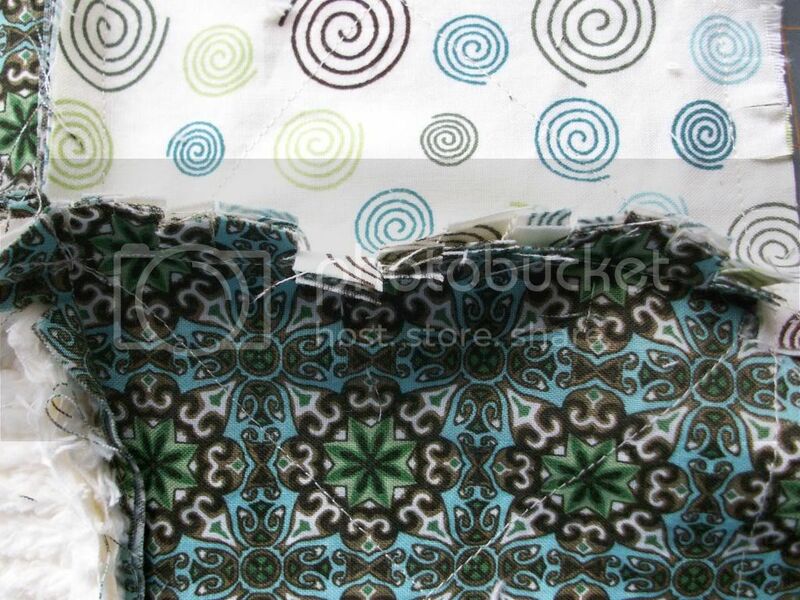 Place two squares of the same fabric back to back with the wrong sides together. Right sides will be out. 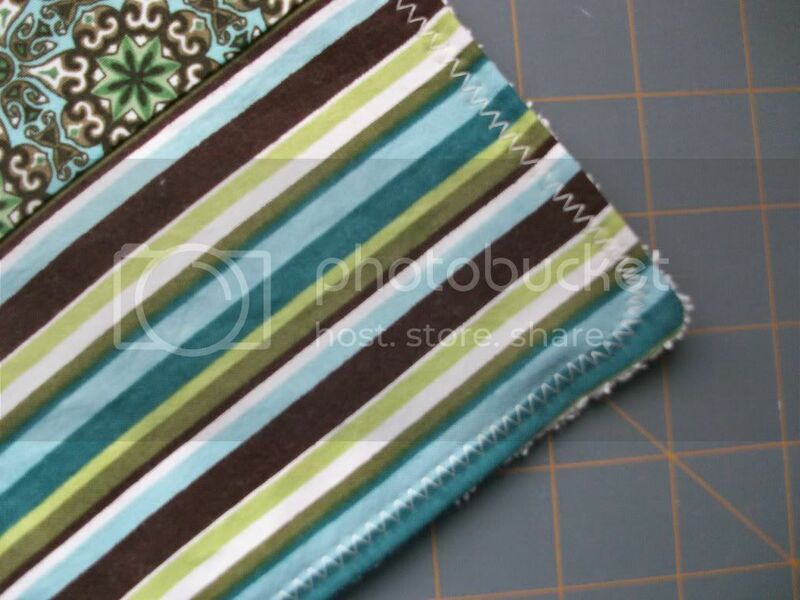 Sew a line diagonally from one corner to the opposite corner. Do this in both directions so you have made a large X on your square. I eyeballed mine, but you can draw a line from corner to corner using a water soluble pencil if you want to use the line as a sewing guide. Be sure to back stitch securely at each starting and ending point. Because I knew I would be cutting through this later, I backstitched for about 1/2 - 3/4 of an inch which is a lot. Cut the extra threads at each starting and ending point. When you have completed the X sewing on all of your squares, you should have 48 squares. I laid mine out in the design I wanted because I didn't want to end up with two of the same patterns right next to each other. I still had to rearrange them as I went along, but it helped to lay them out first. 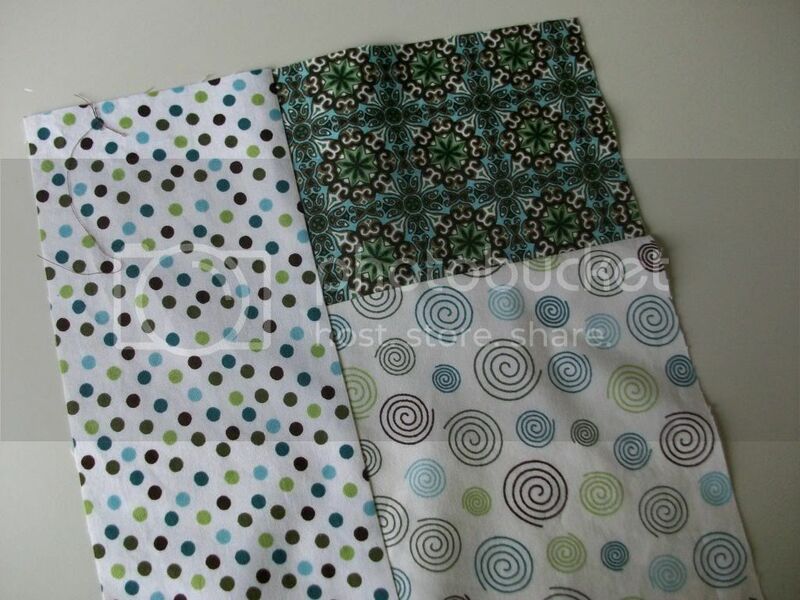 Next, you are going to sew your squares together (1/2 inch seams) in groups of 6. The first two are easy because it doesn't matter which way they go. Just put them together and sew down the right side. Then open it out so the seam is on top (see picture on right) and place the new square under the one you just attached. Sew down the right side again. 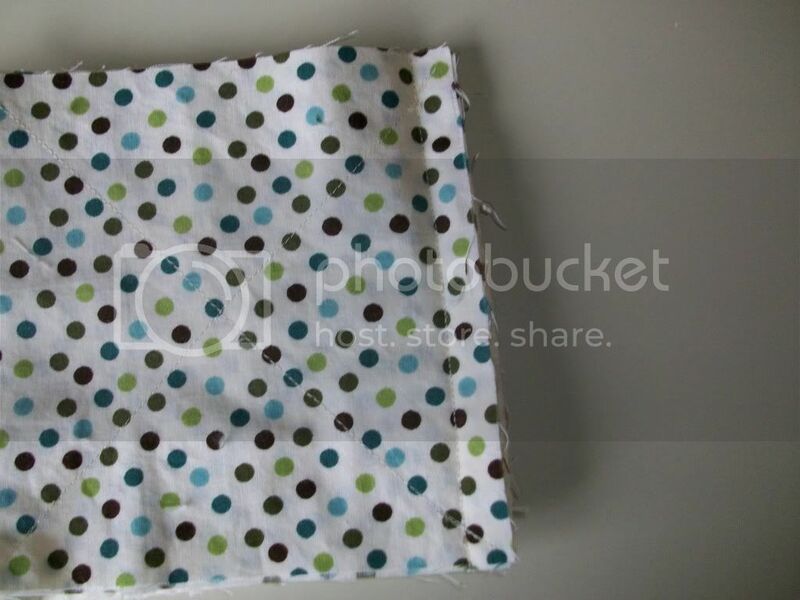 Then, open it out and repeat the process until you have 6 squares sewn together with the seams all on the top. Here are three squares together--seams on the top. 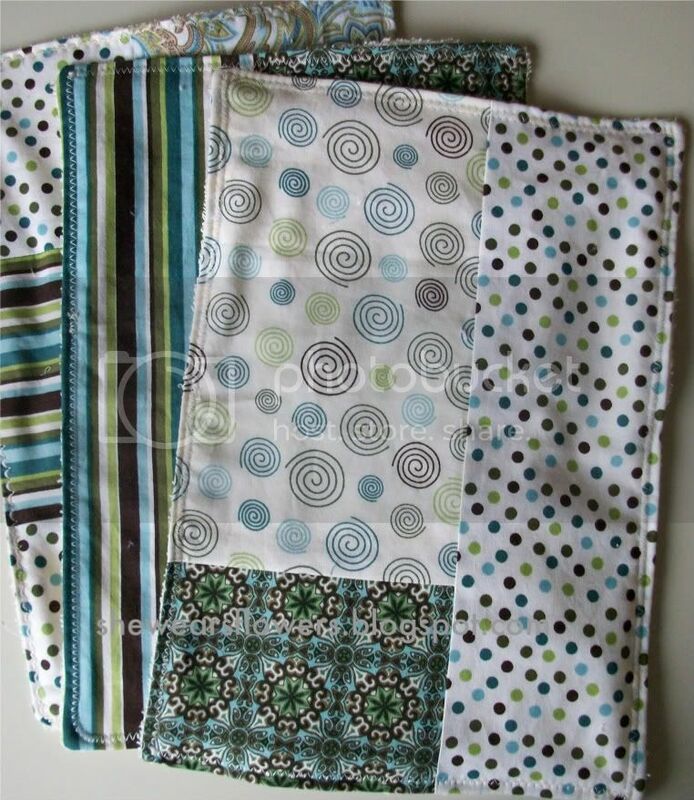 Once you have two rows of 6 squares each, you can sew these together. You can also do this part at the end after sewing all of your rows (8), but I liked doing it as I went along because it seemed like it was going so fast and it kept me from forgetting which squares and rows I wanted together. 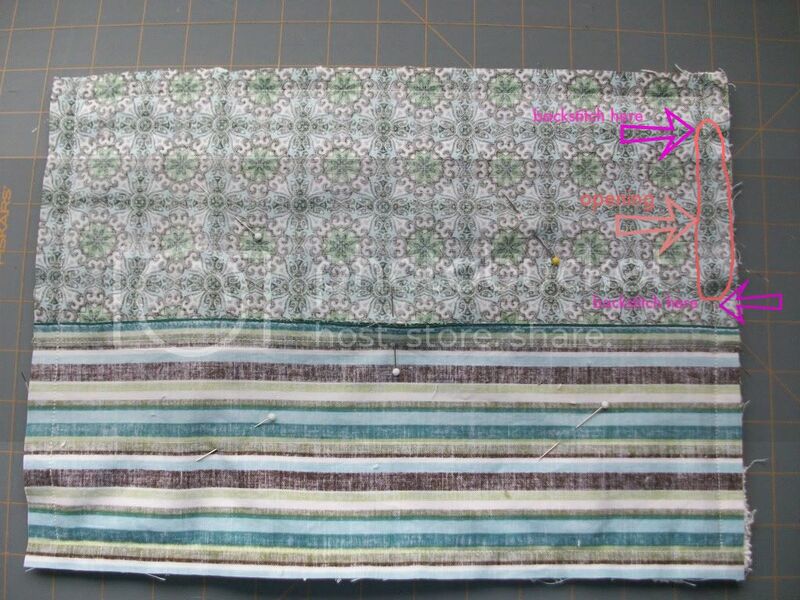 To sew two rows together, put the sides with no seams back to back and sew together with a 1/2 inch seam. I flattened all of the seams down as I went along, but read somewhere since then that you should open them up as you go so they aren't so thick when you cut them later. Next time, I will open them up. 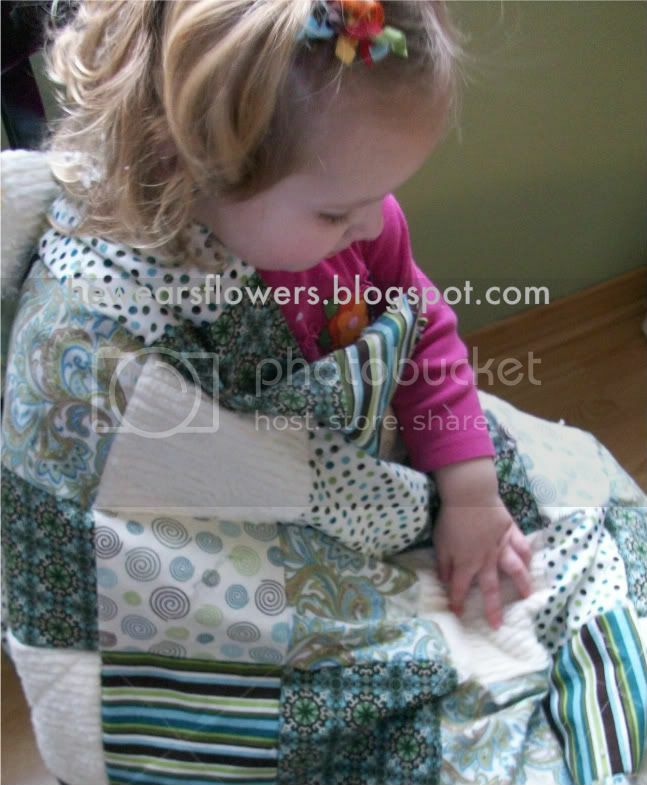 After sewing all of your rows together, stitch all around the outside of your quilt. I sewed each side in a separate line so I could backstitch at the starting and ending points just in case I cut through one side when I did the fringes. Carefully snip approximately every 1/4 inch all around the edges of the quilt and each seam around the squares. 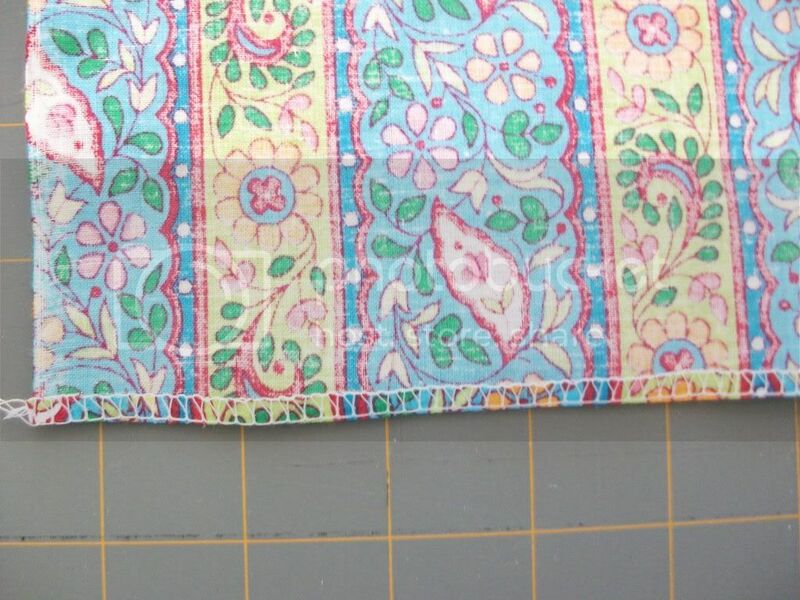 You will cut from the edge towards the stitch line or in your seam allowances which are 1/2 wide. Do not cut through the stitching. 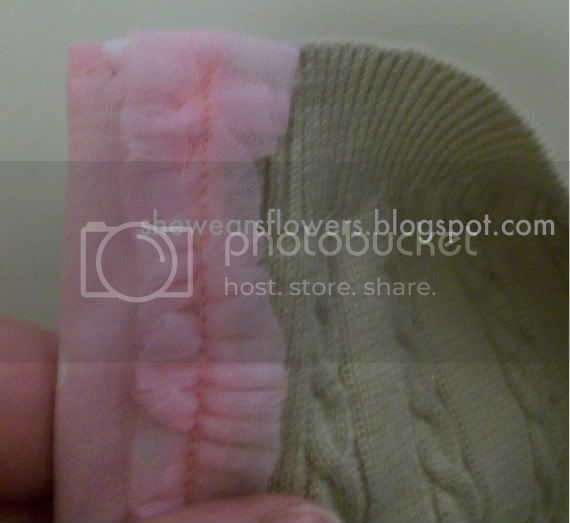 If you accidently slice one through, bo back and sew over it to reinforce that space. Go slowly and carefully to prevent this. Using sharp scissors will help with this, too. Be careful at the corners of the sewn squares; they are thicker and you have to find the right place to cut so that you make a fringe without cutting little rectangles out of each corner. I found it easiest to do all of the horizontal lines and then go back and do all of the vertical lines rather than cutting around each square individually. This part was also pretty messy thanks to the chenille. I used regular-sized scissors and was fine although some people prefer little snipping scissors. I think I was interrupted enough times to give my fingers a break. 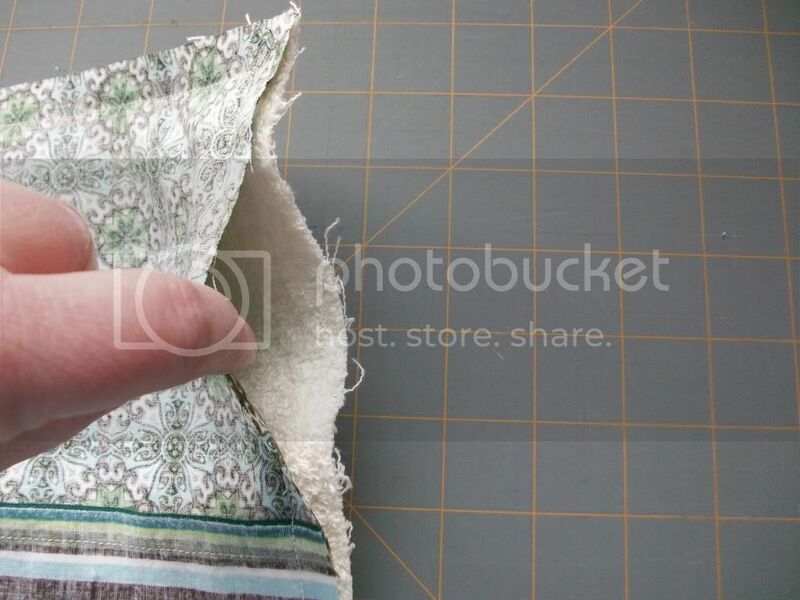 When you have snipped everywhere, lay the quilt across a table or clean floor and run your fingers over each "line" of cut edges to find places you may have missed. I found one missed area, snipped it, and then did it again and found another one. The is the best time to find them so check carefully. 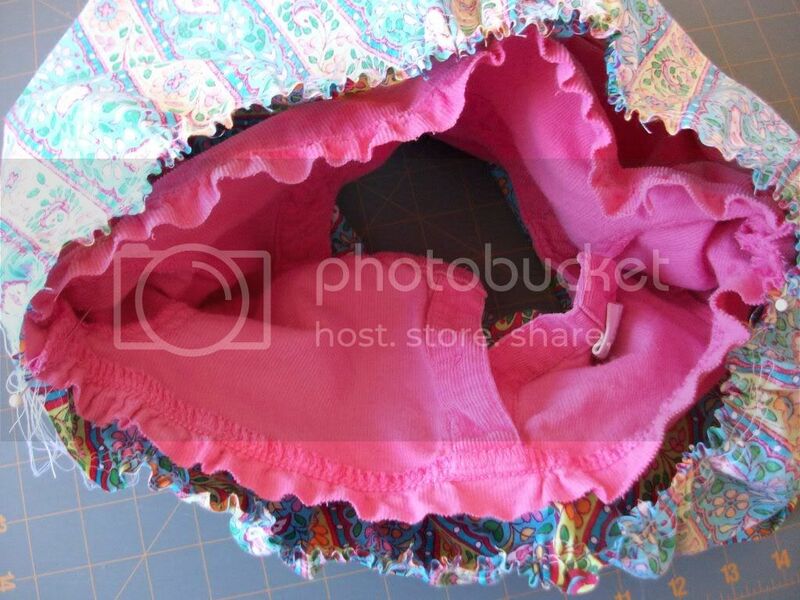 Once you are done, shake the quilt firmly several times to get out all of the loose threads and pieces of chenille. I shook over a large carpeted area so I could just vacuum up my mess. Finally, wash your quilt again in warm water. 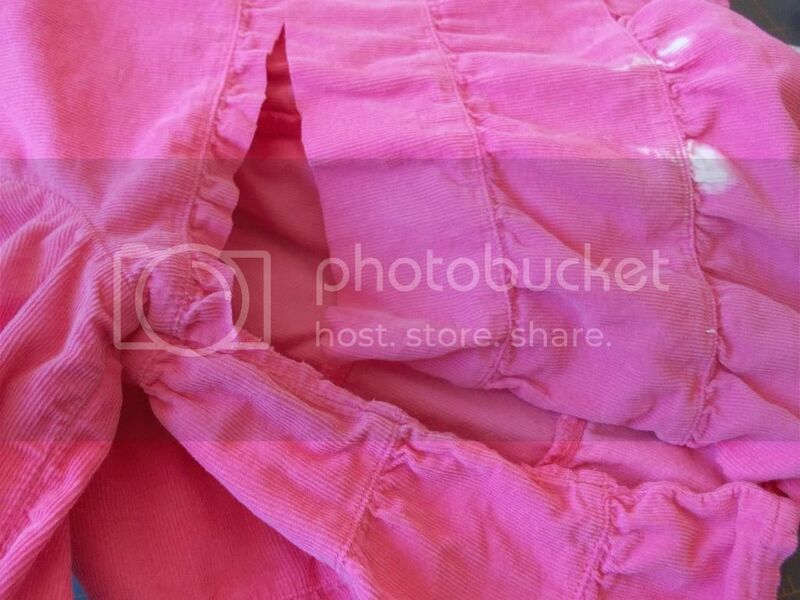 Use a little detergent to help soften the fabric a little more. I also used a fabric softener sheet in the dryer. Dry in the dryer on a medium setting. You may want to check the lint trap halfway through. Mine was coated in little pieces of chenille. I cleaned it out so the dryer could dry more efficiently for the remaining time. 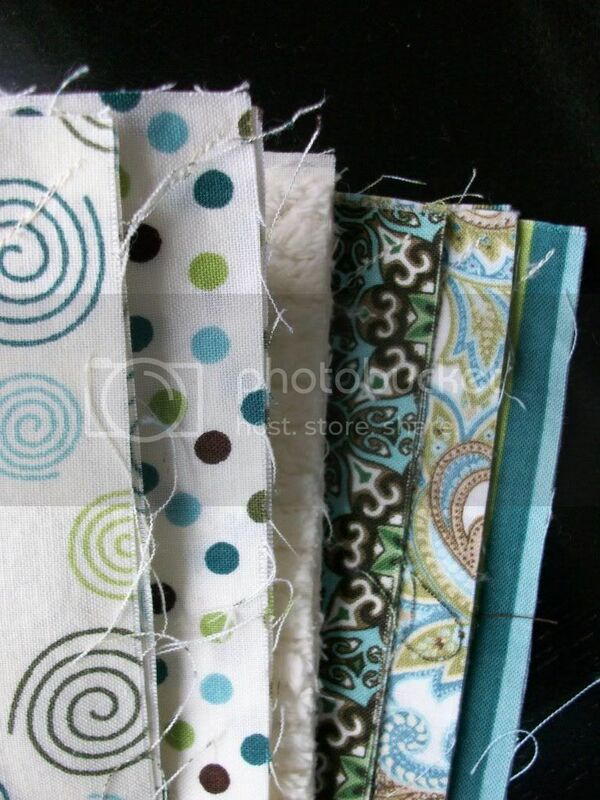 The snipped edges of your quilt should be curly and frayed. I am sorry to say I do not have a picture of the final part with the soft, curly edges--don't ask! I will see if I can get one and update when I do. 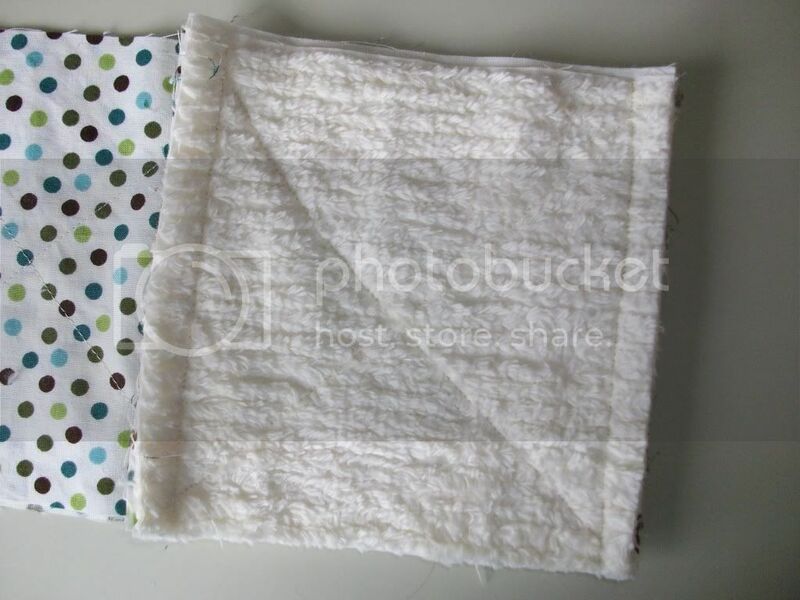 I also made matching burp cloths that I will post next. Happy Valentine's Day! 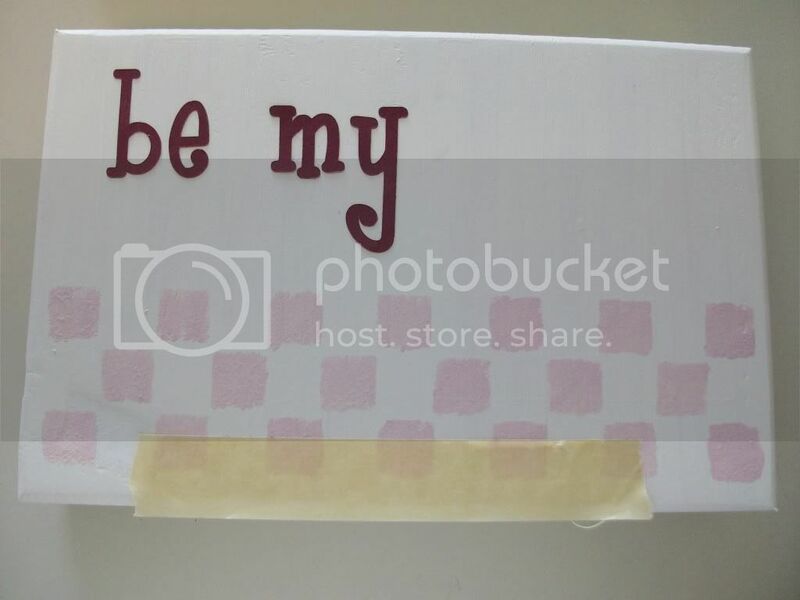 In honor of the day, I thought I would share the older girls' Valentine's boxes for school. The aquarium box was her own idea and the locker was from a Family Fun Magazine. And, I am choosing to think of the following as a poem that should have been titled "Big Sisters' Love for a Little Sister"
And noise to be made. Can you feel the love at our house? It's done or I am done with it! Okay--it didn't turn out to be my favorite, but it is done and I am satisfied with it. Some crafts work out better than others. I'll show you what I did and you can decide what you want to change. Right off the bat, I will say that I think this would have worked a lot better with a 2x4 cut down to about 12 inches rather than a block-y shape. I started off with a block that was 9x6 and about 1 inch thick so it could stand up on its own. 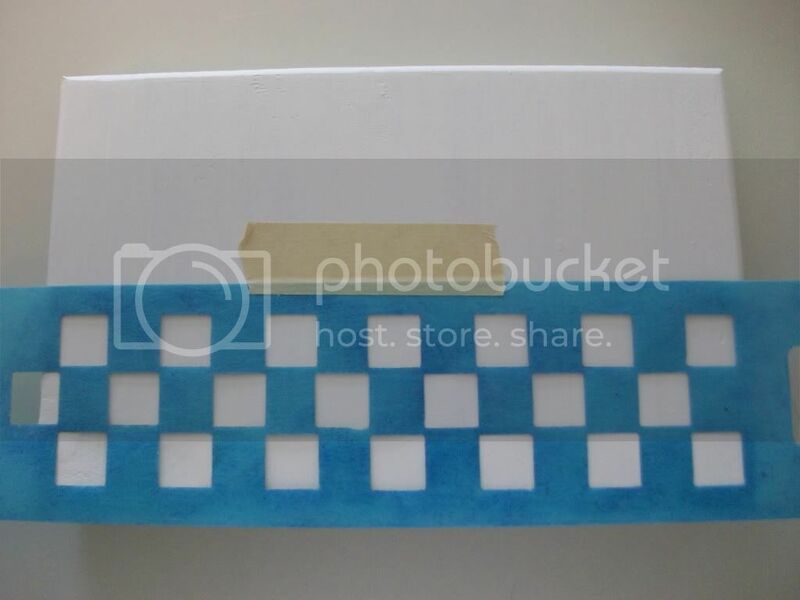 I painted it cream and then added the checkerboard pattern with a stencil. I added the checkboard pattern up the right side when I was trying to dress it up a bit so it doesn't appear in the first pictures. If you are using it, you will want to put it in at the same time you do the first one. Be sure to keep the stencil horizontal for this even though you are making a vertical line. Otherwise, it will change the pattern. Next glue on your lettering. I turned all of mine into stickers so I could just pat them on. I also used masking tape to make a straight line to line my lettering up evenly. This was particularly helpful since the font for my lettering was crazy and the letters didn't naturally line up. The rest is vague because I changed so many times! For the final result, I painted the edges and around the block about 18 times with red paint. It takes a lot to make a nice smooth red! I didn't worry about being exactly even on the edges because I didn't want it to look exactly even. When that was done, I went back with watered-down brown paint and painted a thick section around the edge as well to give a little depth to the whole thing. Then Mod Podge the whole thing. I used two coats, but probably should have done two more! 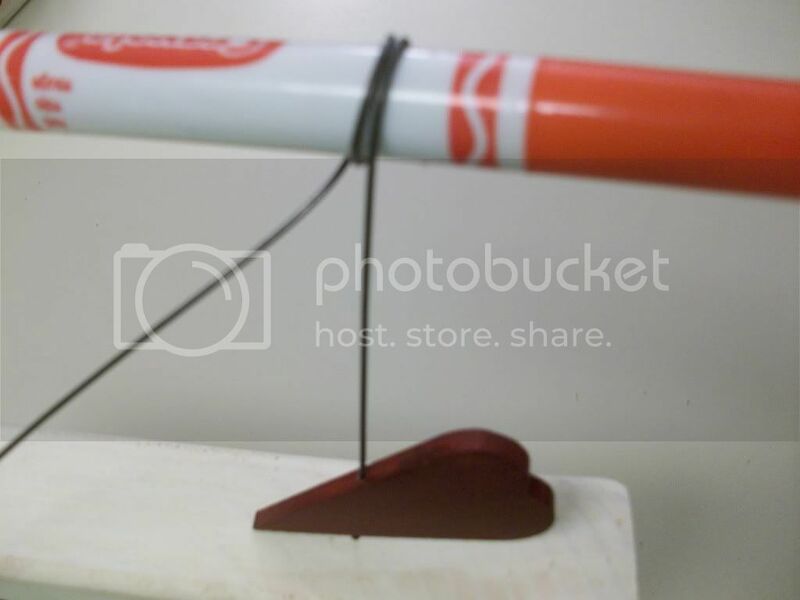 Next, I drilled a tiny hole into the top of my block and through my heart (which was also painted red about 6 times). 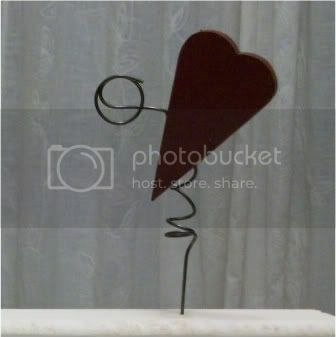 Using 18 gauge wire, I threaded it through the heart and then used a marker to make the twists and turns in the heart. I made a few loose coils under the heart just to hold it up. I also made a few coils above the heart and then squished them flat together. 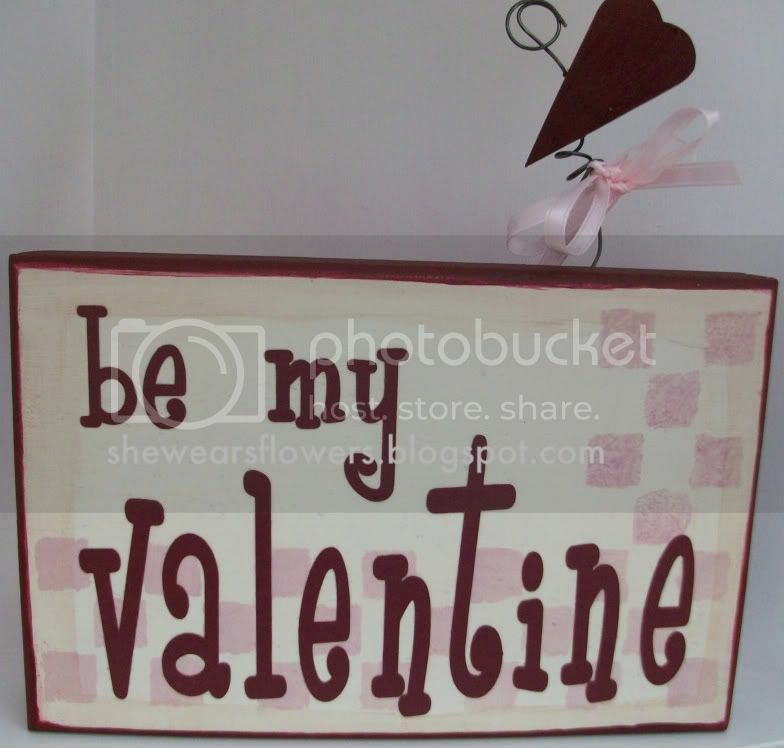 These can hold a picture, a note, a card, or just look decorative. The wire bends really easily so you can turn it every which way until you like the way it looks. I added a bow to finish it off. 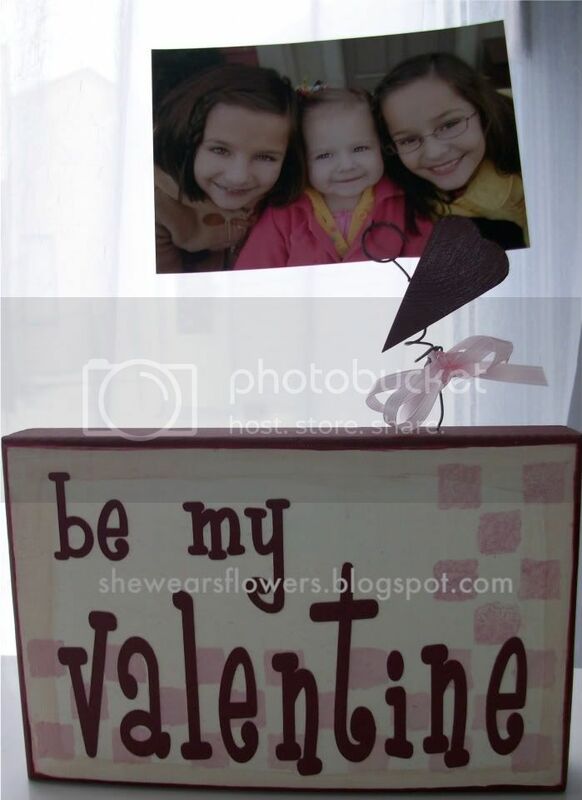 A place to display my little Valentine sweeties!